The 7 suites at Relais La Costa have been recently renovated in keeping with the original features of the building. Expect exposed stone walls, terracotta floors, and beamed ceilings. Each suite benefits from complimentary WiFi and individually controlled heating. The Junior Suites are spacious rooms overlooking the charming courtyard. Furnished with antiques and luxury furnishings, they're perfect for a couple. Sleeping 2 people these rooms have views across the courtyard and gardens. The large living room gives a couple plenty of space to relax in. There's also an option of a loft suite. The Luxury Suites are large with plenty of space and can sleep up to 4 people. These Suites have 1 or 2 bedrooms (with twin or double beds) with 1 or 2 bathrooms and large living room with fireplace. Dating back to the year 1000 Relais La Costa is a boutique hotel steeped in history. 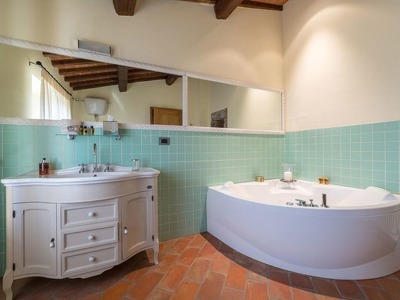 This sympathetically restored building is nestled in a 50-hectare park between the Tuscan towns of Siena and Monteriggioni and is in a perfect position if you're wanting to explore the best of Tuscany. The combination of newly renovated luxury suites, stunning panoramic views, and simple, rustic food will seduce even the most judicious traveller. The outside of Relais La Costa is really pretty and where you'll want to spend most of your time during the warmer months. The pool is perfectly positioned on the rooftop terrace with far reaching views across the countryside towards Siena and the outdoor Jacuzzi is surrounded by olive trees, the perfect spot to enjoy a glass of Prosecco. You can't stay here and not venture out and explore Tuscany, its hilltop towns, vineyards, and countryside. Siena is just 10 minutes away by car and is a breathtaking city. Art lovers can wander around the National Art Gallery and it's a pleasure just walking through the districts called contrada, their squares, their museums and churches soaking up the everyday life of Siena. Monteriggioni is close by too and is a lovely example of a medieval hilltop town. Visit Siena in December and head to the winter market in Piazza del Campo. This experience takes you back in time to the 14th-century with historical and culinary experiences from medieval times. Although Relais La Costa has only 7 suites, it has a perfectly formed spa with a mini indoor swimming pool with waterfall and hydro-massage, a sauna and steam room. You can personalise the music and chromotherapy as well as the treatments and a couple of hours here is a lovely way to end a day out. Driving from Florence or Pisa, take the exit at Monteriggioni and bypassing the town, driving for about 6 km through SR2 ( this is the old street connecting Monteriggioni to Siena) until you reach Bar Ceppo. Behind Bar Ceppo you will find Strada di Riciano with the Sign “ La Costa 4 km”. Driving all straight for4 km until you see another sign La Costa 800 mt through the private wood in a white road. After 800 mt You will be welcome from one of our employees. Driving from Rome, bypassing Siena ( please don’t enter into the town) take the exit at Siena North driving for about4 km through SR2 ( this is the old street connecting Siena to Monteriggioni) until you reach Bar Ceppo. Behind Bar Ceppo you will find Strada di Riciano with the Sign “ La Costa 4 km”. Driving all straight for4 km until you see another sign La Costa 800 mt through the private wood in a white road. After 800 mt You will be welcome from one of our employees. Lungo la Via Francigena, tra Siena e Monteriggioni si trova questa location. Luogo stupendo dove celebrare il vostro matrimonio. Visitatelo di persona, prenotate una camera per un weekend y capirete perché. We spent a week in Italy and this was at the end of the trip. What a gorgeous property tucked away up from the main road a few miles. The room was clean and very well decorated. The spa is awesome. Staff is super nice, friendly, and accommodating. Great job turning these very old buildings into an upscale resort. It was a highlight of our trip. We'll stay again next time. Returned 1year after our wedding at Relais la Costa. It's such a beautiful place with stunning clear views of the Chianti hills and Siena. The food cooked by Marta is traditional, delicious and beautifully presented. Eglantina who runs the place cannot do enough for you. If you want a tranquil location with stunning accommodation and tasty food & wine, Relais la Costa can provide it all. Also a fantastic place for a wedding venue. Located in at the end of a little road in the heart of Tuscany this is the perfect location to relax away from the outside World. Excellent food and hospitality.